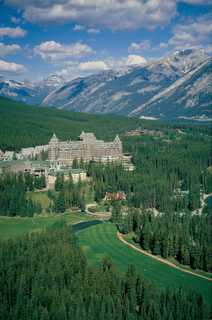 The two courses which make up the Banff Springs Golf Club are the Stanley Thompson 18 and Tunnel 9. 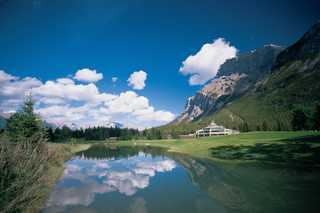 Situated beneath the famous Banff Springs Hotel next to the beautiful Bow River, there couldn't be a more fascinating place to golf. Surrounded by mountains and beautiful forests, don't be surprised if an elk tries to steal your attention away from your game!! The original 18 holes designed by Stanley Thompson in 1928 were given a $4.5-million face-lift in 1999 and the course is now considered to be one of the ten best golf courses in the world. Don't miss your chance to play the notorious Devil's Cauldron! This club includes restaurant, lessons, pro shop, three practice green and driving range as well as CPGA professionals available for lessons. HOW TO GET THERE About an hour from Calgary, take the Trans-Canada Highway west for 122 kms (76 mi) until you reach the eastern entrance to the Banff Townsite. Take Banff Ave through the downtown and cross the Bow River Bridge. Turn left at the intersection onto Spray Ave and proceed to the end where you will find the hotel.